During a recent blissful Sunday afternoon on a London rooftop a friend dutifully informs me that, from an evolutionary perspective, our happiness is problematic. He then plops open the book he is currently logging around town to the page above. 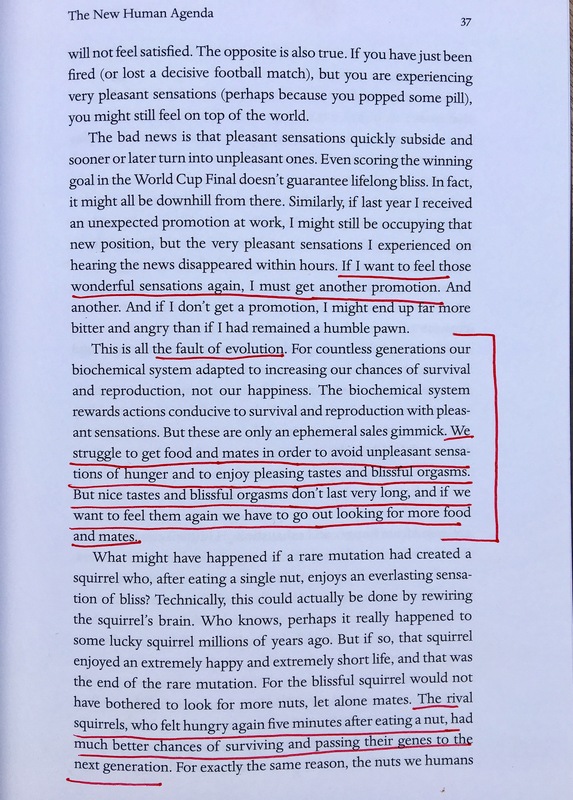 Writer Yuval Noah Harari makes a good point: our evolution is not based on survival of the fittest but, rather, on survival of the hungriest, indeed, the horniest. Those of us who are most adept at wanting and finding instant gratification have a better chance of surviving and reproducing out in the wild. But, we are no longer out in the wild. Here, in an urban context, the constant need for instant gratification becomes a burden, one that hinders our ability to execute long-term plans, which are key to obtaining hapiness’ less attractive but more discerning older cousin: satisfaction. Our biological need to get fed and laid is the reason why Mick Jagger et al can’t get no satisfaction. Perhaps the results would vary if we gave vegan sober abstinence a try. And a try. And a try.